Calf injuries are one of the most common muscle injuries that we see in clinic and, a bit like ankle sprains, are often brushed off as inconsequential but with the right rehab, you can get back to normal faster and hugely decrease your risk of injury. 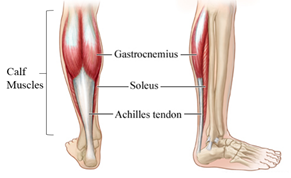 A sign of a torn calf muscle is similar to that of an Achilles tendon rupture. You may think you’ve just been hit in the leg and potentially hear a “pop.” There is sudden pain at the back of the calf. Then you’ll experience pain, swelling or bruising in the calf muscle, and you’ll have difficulty walking properly or standing on your toes. 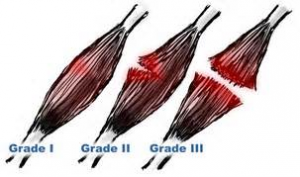 These two muscles merge and form your achilles tendon. The calf muscles, when contracted, make you point your toe, however, they are active when we are doing simple activities such as walking. Calf muscles are commonly injured in sports and activities that involve sudden acceleration or change in direction (such as tennis, netball or skiing), however, they can also be injured just by tripping over your dog! **important – even a mild sprain means that you have small tears within your muscle and should not be overlooked! Your physiotherapy can help guide you through the above POLICE process. We will then work with you to regain movement, flexibility and begin strengthening for a return to sport or work as soon as we believe you are ready to. A huge part of the physiotherapy treatment is education/advice on how to reduce the risk of this injury happening again and the challenge of getting strength back to equal with the non-injured side. Physiotherapy treatment is extremely important with calf injuries! Even those mild, small calf tears will benefit greatly from physiotherapy and early treatment is best!